This is a great class to take to see if quilting is for you. Please note, pillow construction is not included in the course but fabric requirements to make the pillow will be available. Becky is a retired school teacher and an avid quilter and will guide you through the process of cutting, sewing and ironing fabric. You will learn how to prevent the wobbles in borders and an easy method for sewing on binding. This finished quilt size is 38" wide by 44" long. 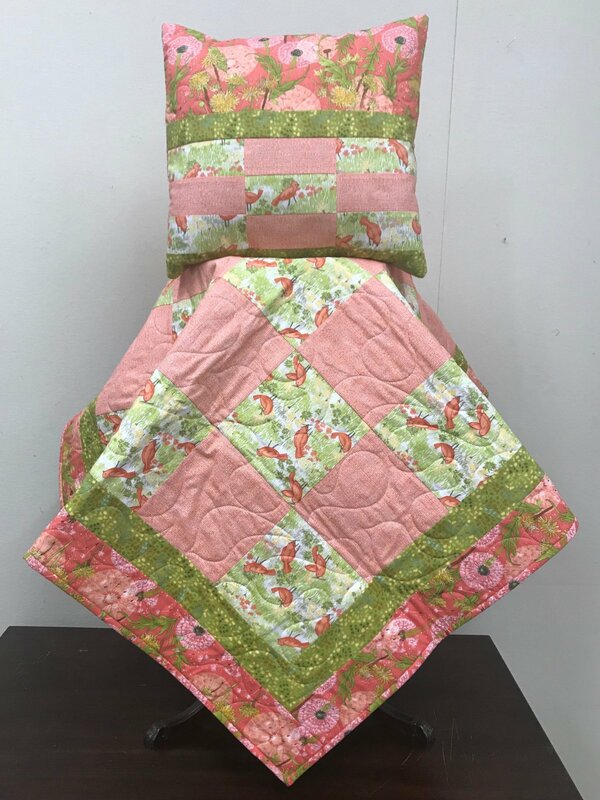 During this class you will decide if you want to take your top home to quilt using any of the following three methods-stitch in the ditch, stitch an X in the center of each square or the stippling method. Becky will offer a 25% discount on her longarm quilting service if you purchased your fabric for the quilt from MY Sewing Shoppe. If you purchased your fabric elsewhere, you can receive 15% off her longarm quilting service.